Who doesn’t love a great sequel? Our first conversation with Eric Severson was one of our most downloaded episodes to date, where we discussed some truly groundbreaking HR and People initiatives that Eric implemented during his time at the apparel giant, GAP. In this follow-up conversation, we dive deeper into some People issues, including transparency in the workplace, the candidate experience, and the realities of working with executive search firms. This episode is filled to the brim with great insight for any business owner or HR leader. You’ll enjoy hearing from Eric Severson a second time around. 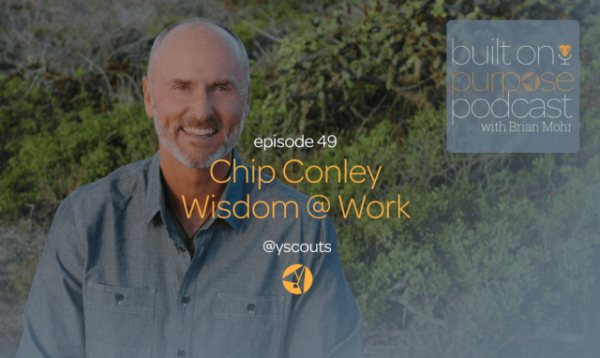 Listen to this podcast interview and more episodes from the Built On Purpose Podcast at https://yscouts.com/podcast. Eric Severson spent over a decade and a half with Gap, and was part of some amazing initiatives, a lot of experiments, many of them incredibly successful. Share a little bit about your time at Gap and how transparency really began to evolve during your tenure there. Gap is an interesting case study of the effect that transparency, culturally, has had on operating practices within corporations. The story with Gap goes back to the 1990s, when Gap was sourcing product internationally. There were accusations of child labor in some of the factories that were not owned by Gap, but by Gap’s vendors making Gap’s product. As a result of that, the company put in place a very robust organization to monitor the labor practices and the environmental practices inside factories. Today, they’re arguably the best in the retail industry. What that meant for Gap, though, way before many of its competitors, was that it had to confront the issue of transparency and openness about business practices in its operations—even those it didn’t directly control. And I think the idea of how corporations have traditionally been managed in the 20th century evolved from the Industrial Age. It was very much about command and control of people, of information, of intellectual property, etc. And many people feel trained in how to manage people by controlling them, as well as by controlling information. What happened very rapidly in the last ten years is that all of a sudden, individuals no longer need to rely on managers inside companies to get information about working conditions, pay, operating practices, etc. It’s instantly accessible via the browser on your phone. So it causes a real revolution and a challenge to the latent practices inside every sort of corporation as leaders feel challenged. They have to rethink how they’ll manage people, manage their compensation, how they manage communication, et cetera. If you had to put your finger on the root cause of why more businesses don’t recognize, or perhaps don’t take advantage of the opportunity to use their brand as a positive force for “elevating humanity”—why is this not happening on a larger scale yet? Maybe the short answer to me is not a simple one. I don’t think it’s as simple as “nobody cares.” I’m sure there are some instances of that. I think part of it is that inertia takes energy and effort to reverse. The traditional way of thinking about social policy is that corporations should focus on making money for shareholders. They should focus on being responsible and how to manage that organization. But they should stay out of politics and avoid taking a position on social issues. And, certainly, this was a challenge at Gap for many years. Any time Gap took a position on a social issue, then protests happened. So when it came out in support of gay rights, for example, protests happened. That was always the conventional wisdom. Now, millennials want companies participating in making the world better. And this isn’t just my opinion; there are many studies showing it. One by MBO Partners last year showed twice as many millennials place their faith in companies to have a positive impact on changing the world than in government. It’s quite stunning, when you think about it. I’ve often wondered: if you end up specializing in one thing, do you begin to look at the world as a search professional in a way that reduces all of the variables to something far too simplistic than it really is? Have you sensed any difference between the go-to-market strategy of the firm that you’ve had a great relationship with? Versus the ones that maybe have been average or not as great as the aforementioned one? I think you’re pointing to a really important element of disruption within the talent attraction space affecting search firms. As the need becomes more urgent within companies for agility, rapid change and rapid adaptability for utility player qualities, then functional experience on a technical level grows less important. Most of the systems and processes within search and talent attraction for assessing candidate qualifications historically focused disproportionately on experience. There’s one trend I see happening that I think is valuable but generally not yet translating into value for the customer at most search firms. It’s the ability to assess capabilities and qualities beyond technical in leaders cross-functionally, so you could then present a slate of candidates for a job that is not traditional. Whereas, say if it’s a chief marketing officer job, you might not present all chief marketing officers. Because perhaps the client wants a leader who has a proven track record of innovation, of empathy and of emotional intelligence. Well, it’s possible some of those trades will be found in leaders who’ve never been a CMO, but they may have enough qualities and technical skills that they can pull it off. You’re never going to know that unless you’re spending time and effort successfully assessing traits and qualities in leadership that go beyond what jobs you had. Y Scouts is a leadership search firm that finds purpose-aligned and performance-proven leaders to help organizations achieve their missions faster. Ready to supercharge your leadership search and get the right person in your organization? Contact Y Scouts. Candi is a prominent voice for exceptional leadership and meaningful performance. Her Purpose Statement: Extracting Colors Outside the Palette to Paint Your Sistine Chapel. Candi’s approach is characterized by open communication, designing and inspiring strong team culture, and producing results that transcend the ordinary. A true entrepreneur, from owning her agency to in-house leadership, Candi has done it all. Leading teams of creative talent, people leaders, and operations to build and elevate brands as Infusionsoft, TravelClick and now Y Scouts. Candi loves people as much as she loves food and therefore is a constant dieter. Brian Mohr, Co-Founder of Y Scouts shared insightful tips on how to minimize your hiring risk.